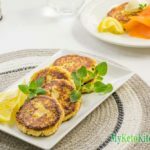 A classic brunch dish, our Keto Cheese Fritters, topped with a dollop of sour cream and a side of smoked salmon. In a mixing bowl add all ingredients except the olive oil. Mix until it comes together into a ball, similar to a very soft dough. Split the mixture into 12 pieces and form each piece into a small round patty. In a large non-stick frying pan add the olive oil and warm over medium heat. Add the fritters and sauté for 2-3 minutes on each side until golden brown. Take care when flipping as the fritters are very delicate. Remove from the pan and serve with a side of smoked salmon, a tablespoon of sour cream and a squeeze of lemon.